The dashboard view allows your to quickly see how much money you are owed recently as well as how many invoices have not yet been paid. 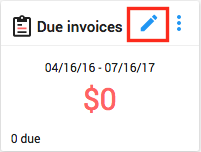 This dashboard will allow you to view a list of your due invoices. 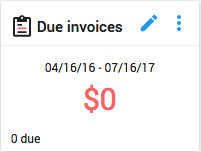 These invoices can be sorted by date range and table column. To view and edit the list, click on the blue edit icon at the top right.